Unolock 3.0 is an ISO/DIS 17712 & CTPAT compliant, high security, bolt security seal, 80mm in length, for use with containers and trucks. 8mm width designed for quick and easy application, supplied in cartons of 250 seals, pre printed with sequential numbers, normally available for despatch within 2 days of receipt of order. Next day delivery. 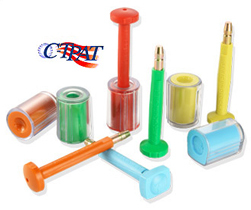 High security bolt seal, suitable for containers and trucks. Pre printed with sequential numbers.